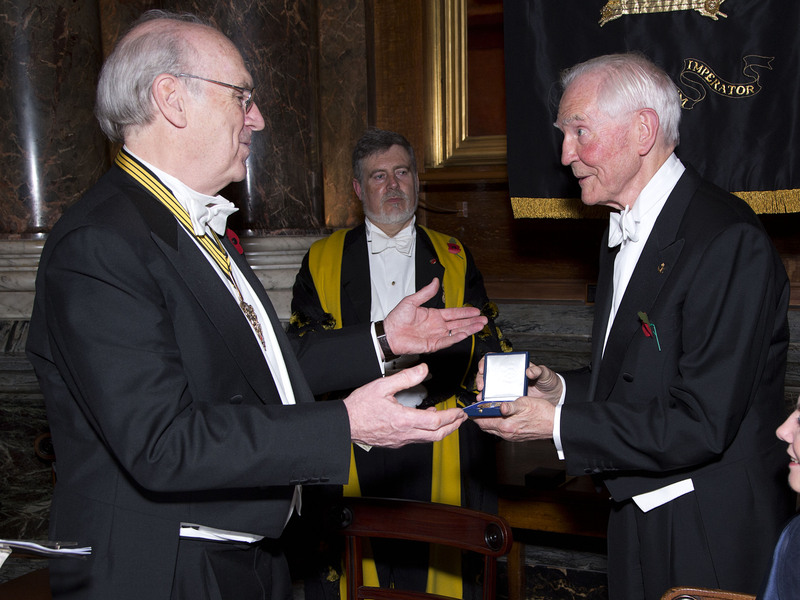 Inventor and horologist Dr John C Taylor OBE has been awarded the prestigious Harrison Medal by the Worshipful Company of Clockmakers at the annual Livery Dinner at Drapers’ Hall, London (November 10 2015). Founded in 1631, the Worshipful Company of Clockmakers is the oldest horological institution in the world, and its prestigious Harrison Medal has only been awarded to six other people. It commemorates outstanding achievements in propagating knowledge of the history of clockmaking and its appreciation, and is named after John Harrison, the renowned inventor of the marine chronometer. Previous recipients include the renowned astronomer and physicist Sir Arnold Wolfendale FRS, horologist Jonathan Betts MBE and horologist David Thompson. Speaking after the medal presentation, Dr Taylor said, “It is an honour to have my work recognised by the Company, and to share the receipt of the Harrison Medal with such well-respected names from the field of horology. “I must thank the Company’s Awards Panel for their consideration of my achievements.” [Photo by Gerald Sharp Photography]. Philip Whyte, The Master of the Company, said, “Dr Taylor was awarded the Harrison Medal because of his involvement in horology as a whole, but especially for his support of the celebrations surrounding the Harrison Memorial in Westminster Abbey and exhibitions at the Royal Society and Goldsmiths’ Hall. Regarded as one of the world’s leading experts in the work of John Harrison, Dr Taylor has lectured around the world and alongside fellow Harrison Medal recipient Dava Sobel, who wrote the book Longitude: The True Story of a Lone Genius Who Solved the Greatest Scientific Problem of His Time about John Harrison. John Harrison was an early horological pioneer, and his ‘marine chronometer’ was the first clock accurate enough to be used for navigational purposes. Dr Taylor has one of the world’s most comprehensive collections of early English clocks, including one of only three surviving John Harrison longcase clocks still working. Four of his items are currently being exhibited as part of the National Maritime Museum’s Ships, Clocks & Stars Exhibition, which has been transferred to Mystic Seaport, the USA’s leading maritime museum. Dr Taylor’s interest in clocks extends beyond appreciation and study – his admiration for John Harrison led him to design and build the Corpus Chronophage, a three-metre high clock that is displayed in an exterior wall of his alma mater: Corpus Christi College, Cambridge. It was unveiled in 2008 by world-renowned physicist Stephen Hawking. It was John Harrison’s grasshopper escapement that made his longcase clocks the most accurate in the world for 150 years, and his sea clocks allowed sailors to navigate using the time. Dr Taylor celebrated that horological breakthrough with the Corpus Chronophage, in which the grasshopper is externalised, enlarged and shaped like a science-fiction grasshopper which stalks along the top of the clock, releasing the huge escape wheel that encircles the face. Dr Taylor has since created three more Chronophage clocks: the Midsummer Chronophage, the Dragon Chronophage and a private commission for a US collector. He is perhaps best known for having created the bimetal thermostat controls inside electric kettles and other small household appliances. To date, over two billion of these thermostats have been used around the globe. He has over 400 patents to his name, making him one of the world’s most prolific inventors. Bimetal itself was invented by his hero John Harrison. More information on the making of the Corpus Chronophage clock can be found here. Dr John C Taylor OBE was born in Buxton in Derbyshire in 1936. Having spent six years living in Canada during his childhood, he returned home towards the end of the Second World War and attended King William School on the Isle of Man before studying Natural Sciences at Cambridge University. Dr Taylor left Otter Controls to build his own company, Strix, which holds four Queen’s Awards. Three are for Export and one is for Innovation, granted for his 360-degree cordless kettle connector, which is used every day by almost every household and workplace in the UK. As well as being one of the world’s most prolific inventors, Dr Taylor has also conducted a lot of research into the subject of horology. He is one of the world’s leading experts in the work of John Harrison, an early pioneer of clocks and time-keeping. This led him to design and help build the Corpus Chronophage, a three metre-high clock that is displayed in an exterior wall of the Corpus Christi College building at Cambridge University. He has lectured alongside American writer Dava Sobel, who wrote the well-known book Longitude: The True Story of a Lone Genius Who Solved the Greatest Scientific Problem of His Time about John Harrison. Dr John C Taylor is on Twitter at https://twitter.com/DrJCTOBE.